Winning the trust of stakeholders while building shareholder value is the work of many years – if not a lifetime – for Asia's best CEOs. In the wake of market scandals, downtrends and peaks, investors look to corporate leaders to enforce good governance so that the companies they invest in will deliver returns not just for the business but also for employees, shareholders and the wider community. For CEOs wrestling with the challenge of leading undervalued companies, practicing the governance principles of transparency, disclosure and engagement can bridge the gulf from being a "good company" to also a "good investment". "We uphold transparency and disclosure when communicating with shareholders and prospective investors so that they will have a better understanding of our unique business model, growth prospects and sustained values," says William Ma, CEO of Kerry Logistics Network (KLN). Ma is this year's Best CEO - Logistics for The Asset Corporate Awards - Asia's longest-running awards on environment, social and corporate governance (ESG). When asked about the challenges confronting him as CEO, Ma admits to the difficulty of leading a company that investors seem to undervalue. "The performance of KLN's share price falls short of our expectation. It has not fully reflected the underlying value of our earnings growth since our listing in 2013. In addition, our valuation is not assessed and derived by investors from the same basis when they are conducting peers comparison due to our unique asset-based business model," he says. His management experience from nearly two decades of being with KLN has taught him that good governance speaks volumes. "The lesson we have learned is to manage expectations and align the different priorities and risk appetite among the controlling shareholders, management and institutional shareholders," he adds. Transforming KLN into one of the region's largest logistics companies has been a multi-year journey for Ma, driving KLN's expansion beyond Hong Kong and developing a unique strategy that focuses on just two major logistics segments: integrated logistics and international freight forwarding. Twenty years since Ma joined KLN, the HK$1.7 million warehousing company has grown into a regional logistics firm worth HK$30.8 billion. Today the company spans over 50 countries and territories with more than 23,000 employees worldwide. And despite the challenging macro environment, Ma continues to put his vision into action by strengthening KLN's network. The company recently entered into a joint-venture with freight forwarding group Globalink Logistics DWC, which has operations across Central Asia and the Commonwealth of Independent States. The Asset Best CEO Awards applaud such achievements, and honour CEOs like Ma who share the vision of leadership based on ESG principles. "We have seen the growing awareness from our business partners, clients and investors imperatively addressing the ESG issues. We believe the trend will further drive growth in responsible investment for long-term value creation and sustainability," says Ma. Visionary leaders, like Ma, look past current challenges toward a sustainable long-term plan. Their senses are attuned to the daily demands of the business, but their hearts lie on their vision of what the business could become. For Joseph Huang, president and CEO of E.SUN Financial Holding, being small doesn't mean you're second best. Huang is The Asset Best CEO - Banking and Finance for 2018. Huang runs the fastest-growing bank in Taiwan. Thanks to Huang, E.SUN stands head and shoulders above peers when it comes to its embrace of technology. What also sets E.SUN apart from peers is its bold strategy of venturing into Asian frontier markets. In the past four years, E.SUN has expanded beyond Taiwan to Southeast Asia. It was the first Taiwanese bank to open a full branch in Myanmar. Currently the bank has presence in 26 international locations across nine countries. It is scheduled to open a branch in Guangzhou, China by the end of the year. As proof of Huang's strong leadership, E.SUN has maintained solid revenue growth in the past eight years - the longest revenue growth streak among peers. Its profit grew by a fifth over the last 12 months. The company is Taiwan's largest private lender to small and medium-sized enterprises. Even if you're the CEO of a big company, you can't get your way all the time. Chang-Ken Lee, president of Cathay Financial Holdings and winner of The Asset Best CEO - Banking and Finance 2018, knows this all too well. As any great leader will admit, not all things go as planned. Lee had his share of disappointments as he steered CFH's expansion. The company attempted to gain a foothold of a market in Southeast Asia when it met a roadblock at the last minute. Lee is a leader that believes failures are opportunities to achieve greatness. He shares these invaluable lessons: make adequate preparation for any endeavour; be flexible and agile that if a plan doesn't pan out, be willing to make changes; put technology to good use. He takes these learnings to heart and that has helped define his leadership. With Lee at the helm, CFH profits quintupled over the past seven years to NT$56.7 billion. CFH is now much closer to its goal of becoming one of the best financial institutions in the region through acquisitions and equity participation. In 2014, it acquired financial firm Conning Holdings for US$240 million. In the same year, it acquired 20% of Philippine bank Rizal Commercial Banking Corp for US$402 million. Lee also spearheaded in 2017 an organizational restructuring at units, Cathay Life Insurance and CUB. Professional executives were appointed to the roles of chairman and president to separate "management" from "ownership". At the same time, a corporate governance and nomination committee was established to further bolster corporate governance. Lee continues to build CFH's presence across China and Southeast Asia where it has representative offices in nine countries. It also has 41 sales insurance offices in China. Lee, like a true ESG leader, is transparent to himself as to others. He is humble enough to recognize a mistake and is willing to learn from it. Sunway Real Estate Investment Trust CEO Jeffrey Ng Tiong Lip shares in this belief that leaders can learn from their disappointments. "As a leader, we make mistakes. However we must learn out of every mistake we make. We must never be complacent. Be it technology, emerging trends, economic and market uncertainties, as leaders, we need to continue to learn and adapt swiftly in order to lead effectively," says Ng, this year's The Asset Best CEO - Property. Malaysia's Sunway REIT has prospered under Ng's leadership. Market capitalization more than doubled to 5.2 billion ringgit in less than a decade. The company completed acquisitions in excess of 1.4 billion ringgit since its listing in Malaysia in 2010. In 2018, the company completed two acquisitions worth 431 million ringgit. Bold yet prudent, swift but with a long-term view. The Asset Best CEO celebrates these leadership traits. But a big part of a CEO's role today is recognizing that adherence to ESG principles is essential for the survival of any business. Research suggests that asset managers and investors are increasing their allocation to companies that observe ESG guidelines. Amid corporate scandals and volatile markets, investors expect corporate leaders to observe good governance to win the trust of the public and deliver returns. "ESG is vital for our long-term success and sustainable business development," says China Unicom CEO Xiaochu Wang, The Asset Best CEO - Telecommunications. He admits, however, that adhering to ESG guidelines isn't always easy. "We acknowledge that there are diverse and sometimes conflicting perspectives on issues such as financial performance, corporate transparency and social philanthropy. We strive to accommodate and reconcile various interests as far as practicable taking into account evolving demands and perspectives," he adds. China Telecom chairman and CEO Jie Yang explains further: "In the face of constant change, individuals and companies must keep up". Yang adds that leaders should aim to have a clear strategy and direction as well as an implementation plan. Leaders should remain open to other people's perspectives, adds Yang, The Asset Best CEO - Telecommunications. At PTT Global Chemical, CEO Supattanapong Punmeechaow, The Asset Best CEO - Oil and Gas, believes that all stakeholders in a business will eventually be drivers of change in companies. They will drive the adoption of ESG in corporates. "For instance, investors will use UNPRI (principles for responsible investment) guidelines when making an investment decision. Global stakeholders will encourage the establishment of a sustainable supply chain; employees will look into equality within the organization," he says. Deep commitment to ESG is vital, says oil and gas firm PTT Exploration and Production CEO Somporn Vongvuthipornchai. 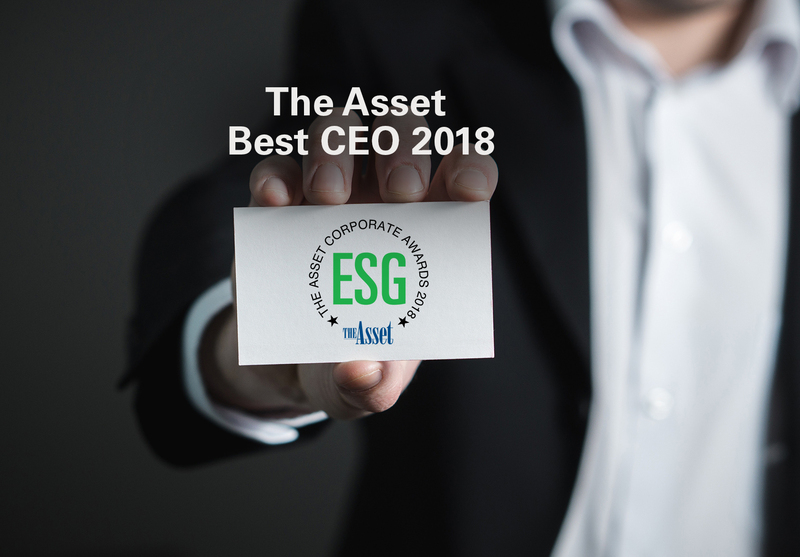 Rising concerns on climate change and technological advancements could drive ESG adoption to a new level, adds Vongvuthipornchai, The Asset Best CEO - Oil and Gas. "Adherence to ESG doesn't translate into greater valuation of the company in the near term. Rather they offer long-term sustainability benefits to the business. A deep commitment throughout the thick and thin of business cycles is key to becoming a true ESG leader. Sustainable development is not just a philosophy we hold dear; it is crucial to our ability to create sustainable values for our stakeholders," he adds. For the list of winners, please click here.